Save that leftover ham and the ham bone to use in this soup. It is delicious, easy, healthy and little to no work at all involved, just soak the beans overnight and you will be good to go! 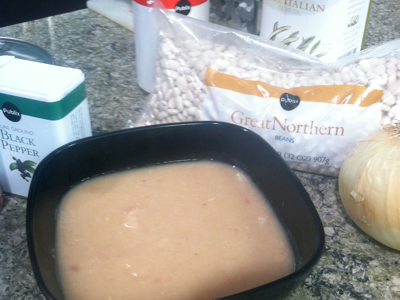 The day before you make this soup, soak your beans in water overnight in a large pot. The next day, drain all of the water. In a large soup pot, saute the onion in olive oil until they are soft, then add the ham bone. Using tongs, "scoot" the ham bone around to flavor the onion. (No need to add salt to this recipe because there is plenty of salt in the ham). Next add the beans, chicken broth, water and seasonings. Cook for at least two hours (if you cook on medium heat) and up to four hours on low. (The longer this cooks, the yummier it is!). You can also do this in the crock pot, and cook on low, all day; about 6-8 hours. Remove the ham bone (most likely the remaining meat will fall off the bone; chop any excess ham and add back to the pot). At this point, if desired, you can blend the soup in batches, to puree the consistency and make it smooth. (You will need to do this in small batches in the blender, due to the heat; or you could do the same in a food processor). Totally optional, and personal preference. I like mine pureed. Serve with your favorite cornbread and hot sauce, if desired.